CallNote for Mac OS X is the type of software that is used to record Skype, hangouts, Viber, Facebook conversations. It’s one of best Skype Recorder for Mac OSx. If you are having a live meeting with someone, you can as well record the meeting. You can also manage your call records from your PC as the end user. Another good thing about this application is the fact that you do not have a limit on the number of recordings that you can make. This is that type of application that will automatically capture your calls, shared screens and chats. Presence of a built in audio and video records manager. This does not only give you the ability to record your Skype calls, but you are also able to view the videos and audio that you have recorded as well as editing them accordingly. Presence of a multilingual interface. This means that it supports the use of different languages ranging from Japanese to Chinese etc. Can record up to over 30 videos and audios calls. Easily records audio and video calls. This is the easiest and most convenient way of managing and recording calls. Whether you are recording your calls automatically or manually, there is an ability to pause and resume your calls during current recording. You can be able to record up to 8 participants that are involved in a call. You can also edit titles and subtitles or even descriptions before saving or after sending to Evernote. You can also be able to alert the other participants that your recording or that recording is taking place. CallNote for Mac requires the Intel and OS X10.7 for it to work excellently. You cannot be able to transcribe the audio to Evernote. Sometimes privacy can be compromised especially if recording gets to happen on a regular phone. To record skype calls on Mac, you will need to be familiar with Quick Time player. The software allows you to record the specific part of the screen where Skype is running. However, you will need to start recording 20-30 seconds before the placing a call on your Skype. Additionally, wave your hand to know when the call started. This will help you later on. Launch your CallNote app to get started. Automatically it’s integrated to your Skype. You have now finished your call, stop the Quick Time player too. Ignore CallNote, it automatically stops and saves your audio file. At this point, you have two audio recordings, one on your CallNote and the other on Quick Time App. Stay with both just in case anything happens. I assume you are familiar with iMovie on Mac. Sync both audio and video recordings we saved above. Launch iMovie and load both audio and video recordings. From the point you waved a hand, cut it and sync both files. Bingo! You are now sorted. Play your call recordings with any available player. 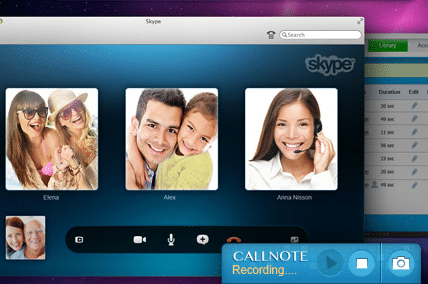 CallNote is the best option when it comes to Skype recording. Whether it’s for domestic use or business, the results are worth the hustle. CallNote is that one application that will enable you to record all your Skype calls and chats. You can actually record the entire call and stop it whenever you wish too. You can also save your calling time as well as the call duration for future reference. Imagine yourself recording up to 30 skype video and audio calls without any limitations and without having to pay for it. This is one of the best versions of software that you can use for recording especially if you are a Mac user.